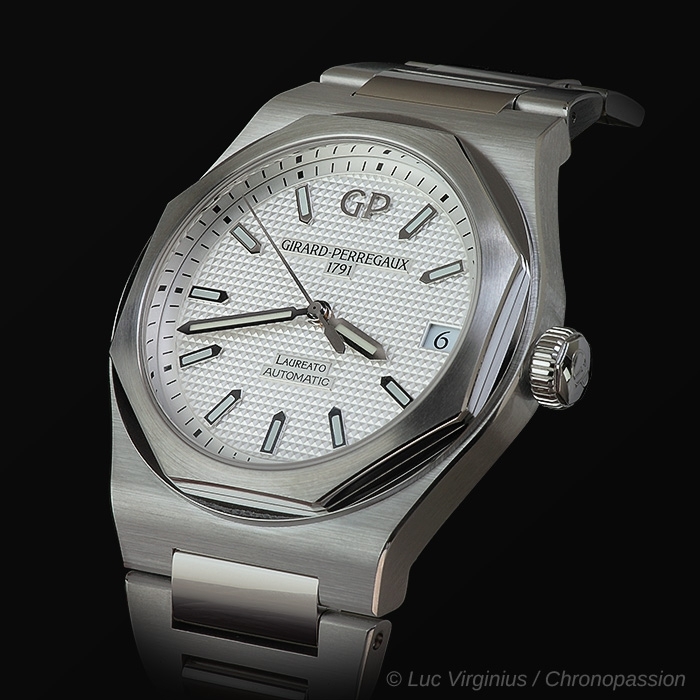 girard perregaux | 11'600 € Tax inc.
Connoisseurs and collectors have been awaiting its return for years. 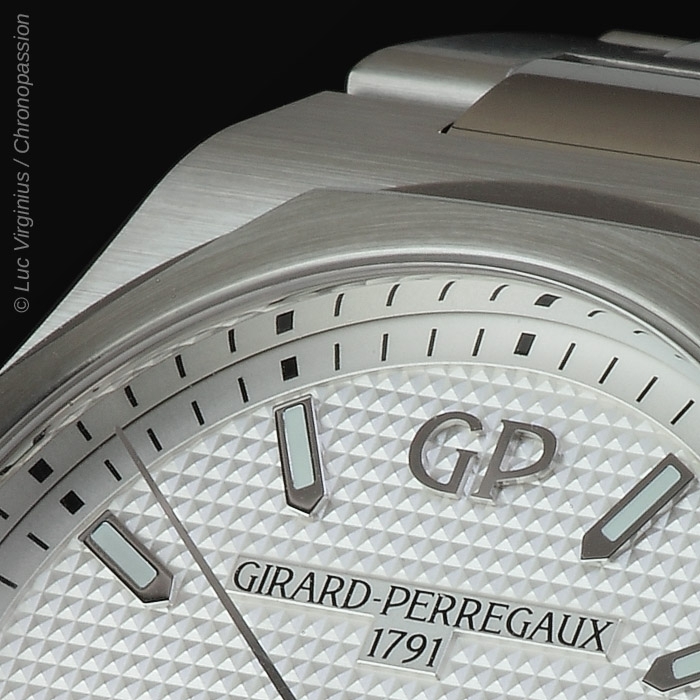 2017 sees the birth of a complete Laureato family, incorporated within the Girard-Perregaux core collection. 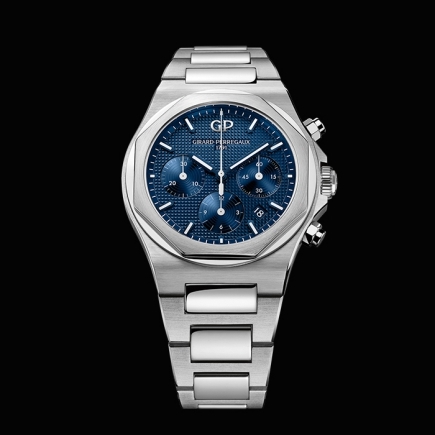 Girard-Perregaux infuses all its legitimacy into this character-filled timepiece, designed for men and women who are aficionados of design, technical sophistication and the art of living. 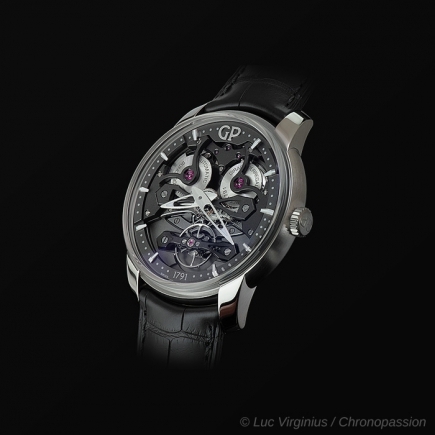 They all bear the unmistakable imprint of the age-old skills and innovative ability characterising the Manufacture in La Chaux-de-Fonds, a major centre of Swiss watchmaking. This Latin proverb translates to “the name says it all”. 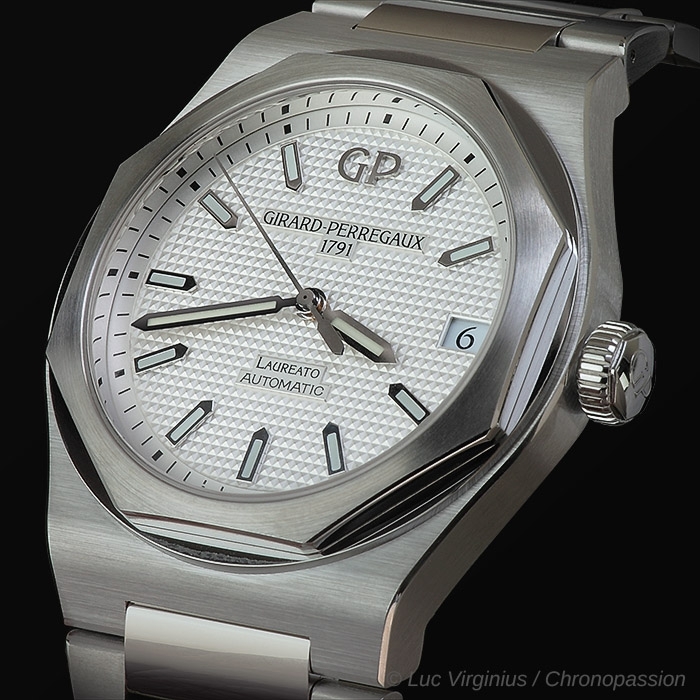 It befits this Laureato model by Girard-Perregaux particularly well, as the following story reveals. Cast your minds back to the mid-1970s, an era in which the art of design was undergoing profound changes. 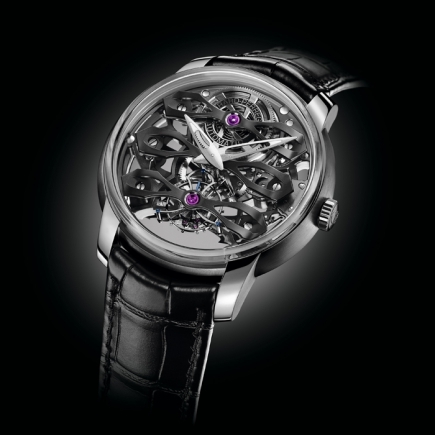 In watchmaking, for example, an unprecedented demand was becoming ever more pronounced: the need for a watch that was sporty, elegant, could be worn on every occasion and featured striking aesthetics distinguished by the integration of the case and the bracelet that should become as one. 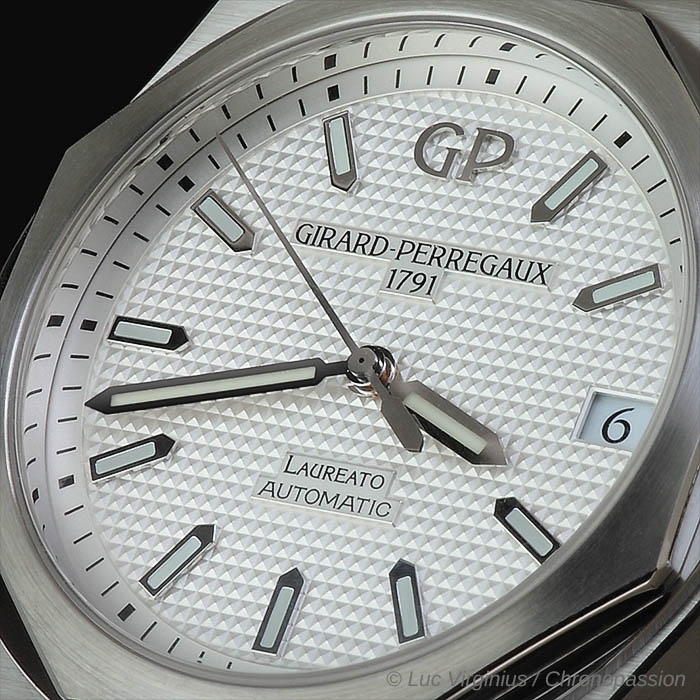 It was in Italy that Girard-Perregaux sought the solution. 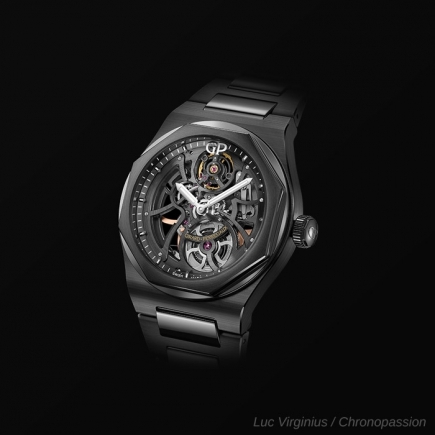 Research for the watch was entrusted to a Milan-based architect. It was clear to him that the element of instant recognition of the watch must be the bezel. Working as a true artist to ensure that the circle and polygon were perfectly matched, he designed an octagonal bezel nested inside a circle. In order to play with light, the eight angles of the octagon were linked not by straight, sharply defined lines, but instead harmonious curves combining fully polished convex or concave surfaces. Let us dare make a comparison here between architecture and watchmaking design: the element of recognition of the Santa Maria del Fiore cathedral in Florence is its circular dome supporting its octagonal structure, which rises above the nave, the transept and the choir of the church. 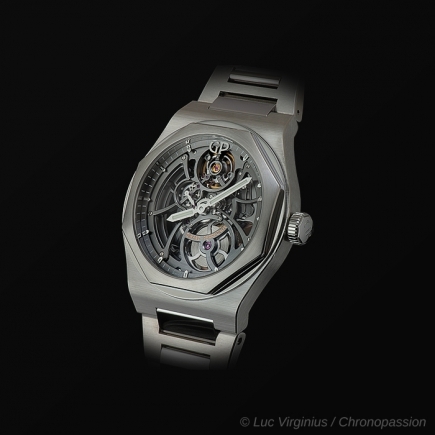 Did the architect wish to miniaturise this concept to the scale of a wristwatch ? 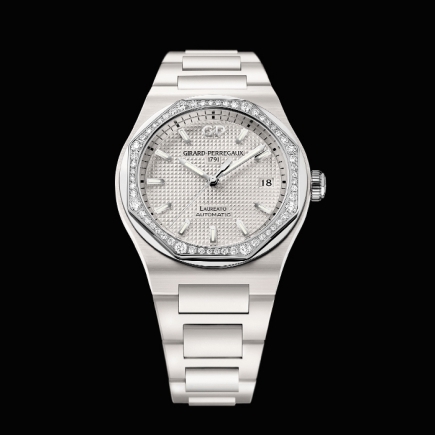 An octagonal bezel within a circle topping a perfectly integrated case and bracelet? The answer is certainly YES. 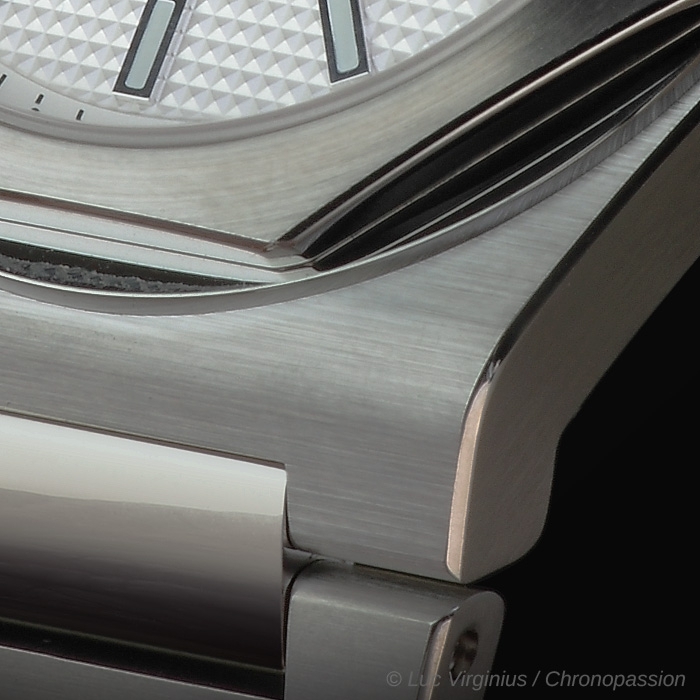 Technically, the 1975 Laureato held another surprise in store: its movement. 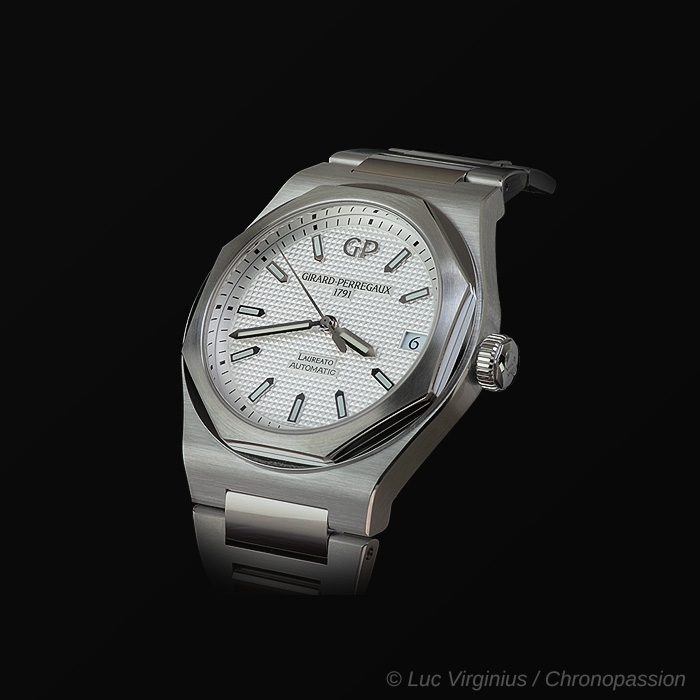 Barely four years after having presented the first quartz movement produced in Switzerland which was relatively large, Girard-Perregaux’ engineers were ready to offer a new, particularly thin, compact movement. 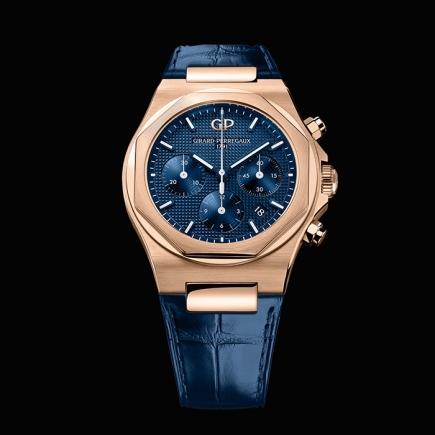 This was the calibre with which the Laureato was endowed. Its chronometric performance was amazing and it sailed with flying colours through official precision tests of legendary severity. 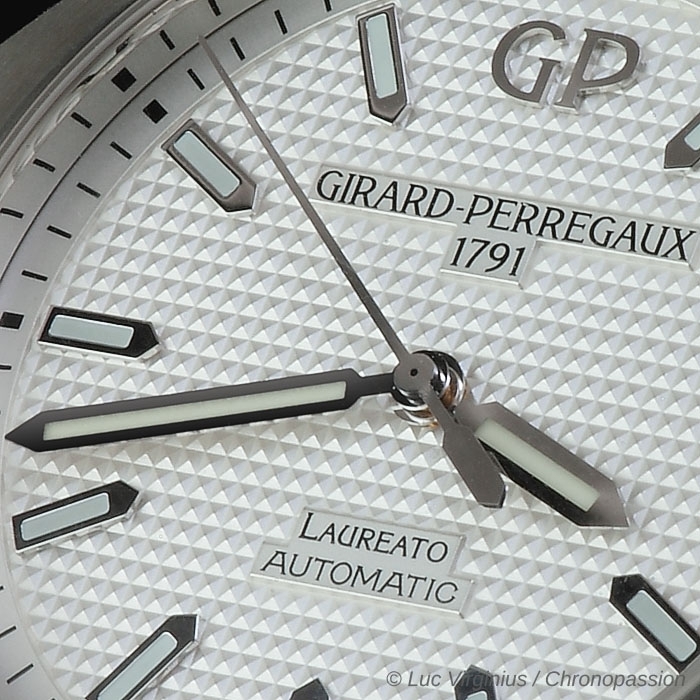 It enabled Girard-Perregaux to become the watchmaking Manufacture that earned the most quartz chronometer certificates in the ensuing years. The well-born Laureato proved truly worthy of its name. 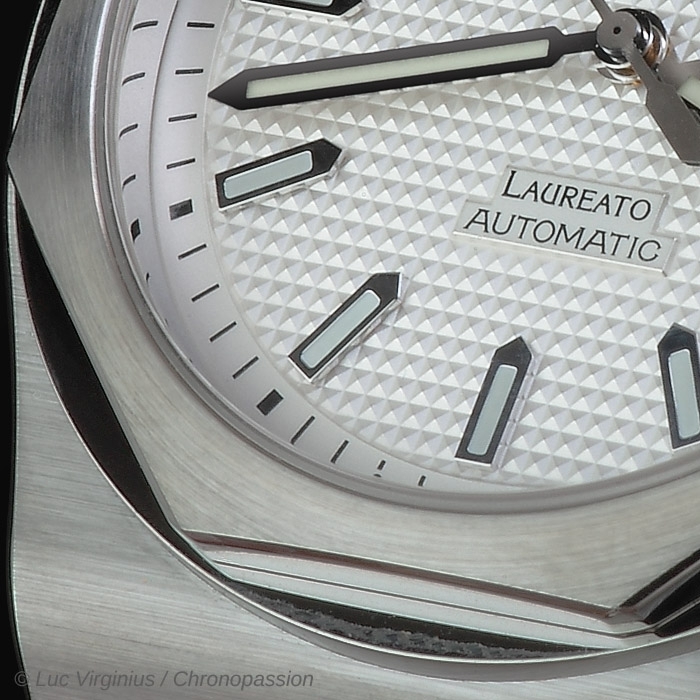 The Laureato has a powerful identity. This exceptional personality draws on a genetic code that enables its appearance to evolve without ever affecting its essence. 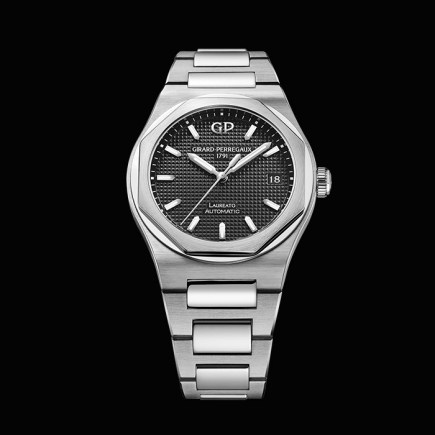 Thus, the Laureato is defined by its polished octagonal bezel, positioned on an integrated case, meaning without lugs or loops. Its metal bracelet is a natural extension of the case and an integral design element in its own right. This metal bracelet is characterised by its large H-shaped satin-finished links and by its domed and polished inter-links. 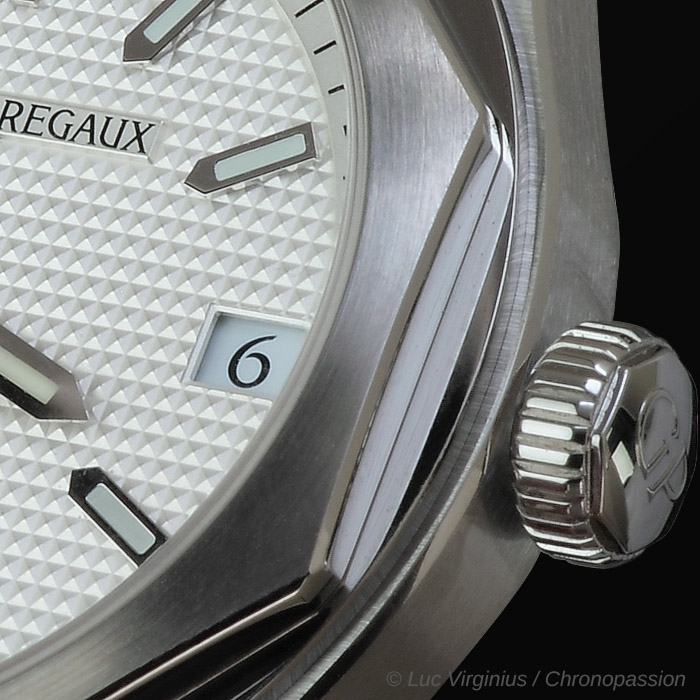 The play between polished and satin-finished surfaces creates a pleasing depth effect and enlivens the watch. When it comes to its feel on the wrist, the bracelet is endowed with the most important quality of all: exceptional flexibility. 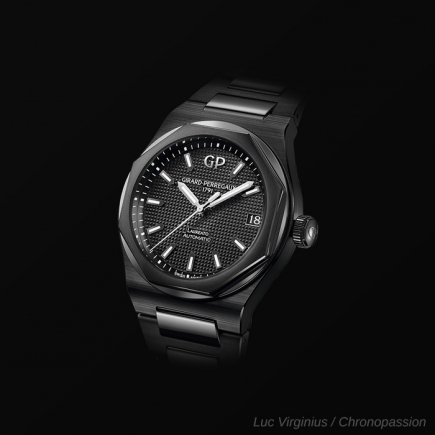 This makes the Laureato perfectly comfortable on any type of wrist. 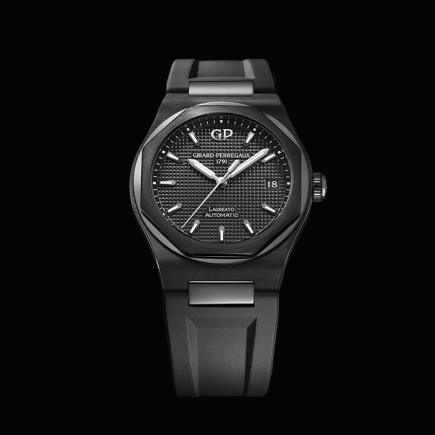 The Laureato by definition has a Clous de Paris hobnail pattern, a collection of tiny pyramids which fill the entire opening of the watch and capture the light. But over and above this, the Laureato is a mind-set. Sporty because it is tough, chic because it is enriched with meticulous details, it is just as suited to important occasions as it is to everyday wear. This versatility is the result of intense thought around the idea of ergonomics, volume and style, which has given rise to four new lines.